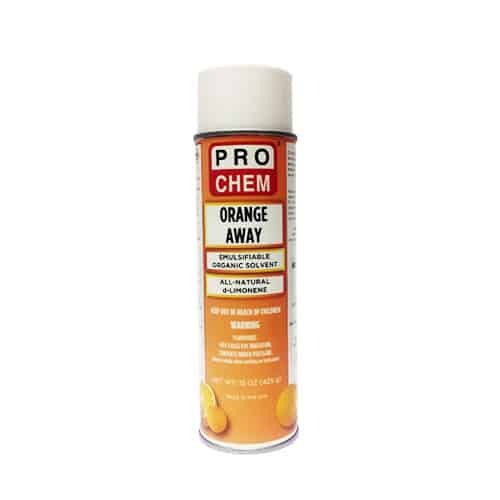 Orange Away | Pro Chem, Inc.
ORANGE AWAY is a powerful, natural cleaner that is strong enough to strip away tar, wax, gum deposits, adhesives and more. It is made with the solvent d-limonene, which is made from natural orange peel extracts. It combines the power and versatility of a multipurpose solvent cleaner, with the ease of an aerosol. Spray directly onto surface. Allow to work for 30 seconds. Flush away loosened deposits with water. On fabrics and plastics, test in an inconspicuous area before using.